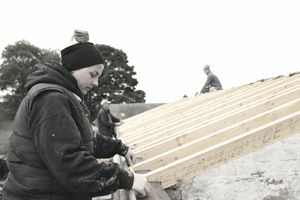 Workers in cold weather could be exposed to serious health problems such as trench foot, frostbite, and hypothermia. In certain instances, workers exposed to severe weather without personal protection equipment (PPE) can also suffer shock that could lead to death. Workers under cold or frost weather might show some signs as uncontrolled shivering, slurred speech, and erratic behavior. If you see someone with at least one of these symptoms, call for emergency help. Below you will find some tips and general recommendations on how to keep your construction crews warm during the winter season. Beware of the environmental conditions and the expected forecast for the day that could present problems. Train workers about weather injuries and how to protect themselves. Provide or encourage construction workers to wear appropriate clothing, including layers that could be adjusted to various weather conditions. Provide short breaks in warm environments for workers to warm up their bodies, or to dry their clothes. Schedule work for the warmest part of the day. Moving the daily work hours to hottest hours or when the sun is at its maximum exposure. Avoid drinks with caffeine or alcohol. It is recommended to replenish your body with sugar water, or regular sports drinks. Protective clothing is needed when work is expected to be executed at or below 4º C/40º F. Proper clothing should be selected to suit temperature, conditions, duration of the activity and location where the job will take place. Wearing proper clothing will reduce the possibilities of excessive sweating, thus reducing the risk of an injury. When possible wear multiple layers instead of a single layer. If possible, a wool cap or a liner under a hard hat can reduce excessive heat loss. Gloves should be used when the temperature is below 4º C/40º F and mittens should be for work below -17º C/2º F.
Workers in cold weather also need to wear proper footwear protection. When the work involves walking in water, waterproof boots must be worn. Leather boots can be treated and waterproofed with special products that do not block the pores in the boot surface. The best-suited shoes are leather-topped boots with removable felt insoles. Wearing one or two pairs of thick socks is recommended if you want to protect your shoes. Having extra socks are preferred because socks tend to get damp during the day. The outer sock should be a larger size than the inner sock, to avoid extra compression. Extra caution can also be implemented on metal handlebars and tools that must be operated in cold weather. Metal handles and bars should be covered by thermal-insulating material. Machines, tools, and equipment, in general, must be designed so they can be operated with a proper grip using mittens or gloves.